Whether it be an online or a traditional marketing strategy, the main goal of marketing your business is to increase your sales and to achieve a sustainable competitive advantage in the market. Marketing includes all basic short term and long term activities in the field of marketing that deal with the analysis of the strategic initial situation of your company and the formulation. 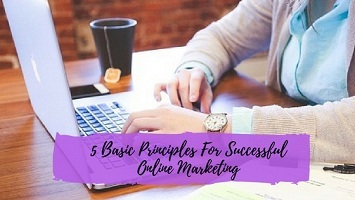 And to build up a successful business online, ask any marketing experts about the most vital parts of online marketing principles, you will probably come up with these list of five major responses. The dead-end principle means that your web marketing effort should not just only exists on the web, it must also give perspective to your customers a reason to look around and take actions. Otherwise, it will be the same as having them to see your advertisements and then turn around and go elsewhere. Your ad was a dead-end to your customers that they did not get anything out of your ad. No matter how informative your website is, with gorgeous graphics and winning layouts. If your website does not encourage your visitors to take certain actions on your site then you are just taking up web space and is not actually filling a purpose. Therefore, when you are designing your web marketing strategy before even building your site. You should ask yourself how you can obtain and attract your visitors and lead them to your sales page. Giving and selling principle refers to the fact that when people shop online they expect to receive something a little extra from others who have similar products and services. Therefore, one of the fantastic methods for attracting more customers to your website is to give something to them for free and then attempt to sell them something else. The first step is to attract your customers to your site is by using a good amount of free information. Secondly, is to inform your prospective customers about your products and services and about the free stuff that does not need to be something tangible. Even the information has value and then once your visitors are hooked then you can make your visitors ready to learn about what want to sell to them. Trust is an extremely important principle for every web marketers. In fact, many experts believe that it is the most important of all the other principles for selling your products and services. Without trust, your visitors will not simply buy from you and you will not have a business. Selling well known and respected name brands by clearly displaying your privacy shipping and return policies. By joining well-known and reputed organizations and by offering stuff you guarantee that you will stand by your customer. The friendly system based on quality and transparency allows you to build your credibility and will earn the trust of your prospective customers which will lead to more sales of your products and services. Push and pull principle works by pulling people into your website using attractive content and then pushing your information to hem on a regular basis using emails. This can be done in a number of ways, most commonly this has to do with opt-in programs such as newsletters and updates about sales and other promotions. Since websites are relatively passive it is extremely useful to add an active element to the prospective customers of your existence and entice them to act on what you offer. Niche marketing has become a vital part of the internet marketing industry. It is a recognized fact that to be successful especially with online businesses, you need to know that your niche and market directly to your potential customers. With a small business finding the niche must be filled in order to give your customers enough leverage against the competition. Your niche allows your business no matter how large or small you focus on the certain corner of the marketplace limiting the competition and focusing on the precise type of visitors who will be most likely to become your customer. The key to niche marketing is, to begin with, a business plan, to identify your focus and purpose and then to build your website and a marketing strategy based on the vision you have outlined. This encourages your consistency and accuracy throughout your online marketing efforts. Creating a successful marketing strategy online by making sure that these principles are all fulfilled, you can be certain that you will increase your number of new visitors and perhaps, more importantly, encourages past and current customers to return to your business. Thanks Phoeobe that my blog help you.